Shimadzu Scientific Instruments (SSI) announces the release of the nSMOL (nano-surface and molecular orientation limited proteolysis) Antibody Bio-Analysis Kit. Applicable to a variety of pharmaceutical antibodies, this proprietary technique enables selective proteolysis of the Fab region of monoclonal antibodies to dramatically improve the productivity and robustness of LCMS mAB bioanalysis. The nSMOL Antibody Bio-Analysis Kit is a ready-to-use reagent kit for collecting monoclonal antibodies from blood or other biological samples using immunoglobulin collection resin, and then performing selective proteolysis of the Fab region of these antibodies via trypsin-immobilized nanoparticles. Variable region-derived peptides produced by limited proteolysis can then be quantified via MRM measurements utilizing Shimadzu’s high-performance LCMS-8050/8060 triple quadrupole liquid chromatograph mass spectrometer. The simplified workflow eliminates the steps of denaturing, reduction, and alkyation normally associated with protein digestion, resulting in more efficient sample preparation and analysis. With the nSMOL Antibody Bio-Analysis Kit, the region of the antibodies subject to analysis (Fab region) is selectively fragmented. This results in a sample preparation protocol that dramatically suppresses background noise and ion suppression, which leads to improved response and quantitative repeatability. In addition, the selective collection of Fab peptides limits contamination from excessive peptides or trypsin. The release of the nSMOL Antibody Bio-Analysis Kit reflects Shimadzu’s focus on consumables and continues its commitment to accelerate laboratory workflows. 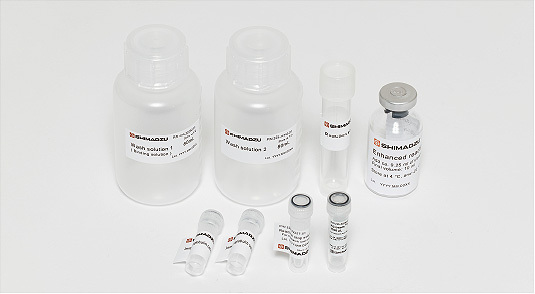 For more information about Shimadzu’s nSMOL Antibody Bio-Analysis Kit, click here. About Shimadzu Scientific Instruments Inc.
Shimadzu Scientific Instruments (SSI) is the American subsidiary of Shimadzu Corp., headquartered in Kyoto, Japan. Founded in 1875, Shimadzu is a $3 billion multinational corporation with three major divisions: Medical Diagnostics, Aerospace/Industrial and Analytical Instruments. In the United States, SSI has a network of more than 50 locations providing local and regional sales, service and technical support. Visit http://www.ssi.shimadzu.com for more information.